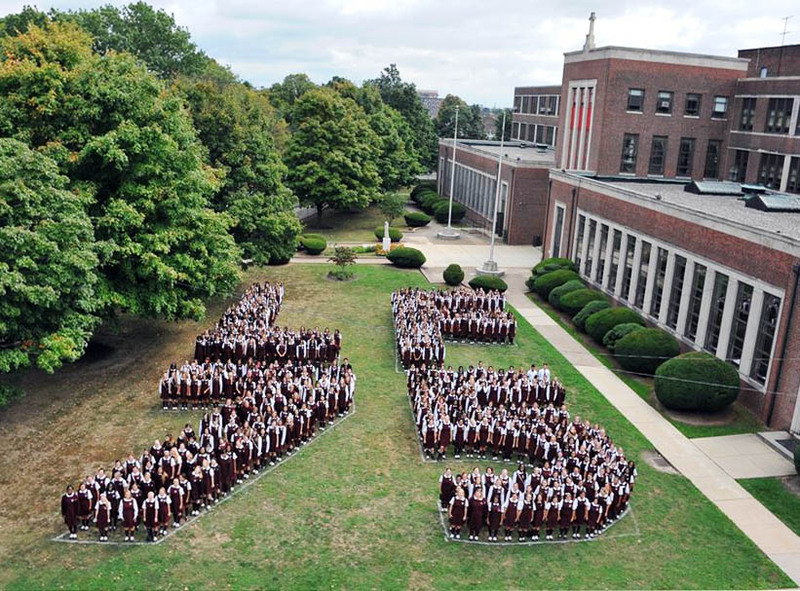 Philadelphia’s Little Flower High School officially marked its 75th anniversary on Oct. 1, which by no coincidence happened to the feast of St. Therese of Lisieux, the Little Flower. Back in 1939 when it opened the name was hand-picked by Cardinal Dennis Dougherty, who had tremendous devotion to St. Therese, to the point that he was instrumental in promoting her cause for sainthood, which came to fruition in 1925. Little Flower High School, located at 1000 West Lycoming Street, was built just as the whole country was recovering from the Great Depression and it was not a sure thing the money to cover the construction could be raised. As part of the celebration, Bishop Robert Maginnis celebrated the anniversary Mass, and it was a happy choice — he too has devotion to the Little Flower, as exemplified by the first-class relic of the saint he always carries, and showed to the students. The impressive procession at the Mass exhibited the 75 class banners for the estimated 35,000 alumnae of the school, according to Immaculate Heart Sister Donna Shallo, Little Flower’s president. After the school was founded, Cardinal Dougherty wrote to Mother Agnes, St. Therese’s birth sister, who was still superior at her carmel and asked if she would compose a prayer for the students of the new school. A printed card of this prayer was given to each student at the celebration and also a rose, the flower that is so identified with the Little Flower. I am of the Class of 1956….I spent the happiest 4 years of my life at Little Little Flower High School. Looking back today I can say without a doubt that the education I received was exceptional, and prepared me to enter the health care community immediately following graduation and where I remained for the next 50 years. God bless and give heaven to all the wonderful Sisters who taught me. A wonderful school. My mother graduated from Little Flower and had many fond memories. St. Therese played a major comforting role for mom during the last months of her life. Especially being accepted into Sacred Heart Manor Nursing Home on Germantown Avenue, run by Carmelite sisters. Many told me of long waiting times for family members to gain entrance to this wonderful nursing home. Mom got right in in circumstances too incredible to be pure luck. I believe St. Therese had something to do with this. Sad that SHM no longer exists.